What do you envision for the future of content from a marketing perspective, and how do marketing teams need to evolve to prepare? Design your content marketing strategy to produce “network effects.” The connection that your customers develop with one another – the value exchange you foster and curate between them – matters more than the direct value of the content you create. As the global workforce becomes younger, online engagement must grow even more. The new decision makers want to co-create products and content. They want to feel connected to the brands they select and build relationships with peers that have the same loyalties. A collaborative community platform is critical to reach this demographic – these people will become our biggest advocates. Take a hard look at your online community platform. How easy is it for members and visitors to leave feedback? To suggest ideas? To submit content? Do you reward people for participating? Online communities are more than support forums. A robust community with a rich content library, diverse contributor population from across your enterprise, and active engagement programs will turn visitors into members – and keep them coming back for more. For many companies, interaction and collaboration are becoming more valuable than product. Our marketing engines need to find ways to match this shift. Specifically, prioritize using content to convert people – especially influencers and prospective partners – to conversing with us, not necessarily to purchasing from us. While conversations don’t provide immediately measurable ROI, they build the framework and potential for positive business growth. In other words, invest your time in building a community that helps you deliver on your business goals. Tomorrow’s most successful organizations will be those that incorporate content marketing into Agile marketing teams. If you want to move your company in this direction, prepare to overcome barriers so that you can invoke the political will required to change the workflows, hiring practices, and training approaches to align with Agile methods. And be patient. It takes a while, especially for larger companies, to close the gap between Agile theory and practice. In the past, content was created to serve marketing campaigns; it was usually created after the campaign concept had been defined. Forward-thinking companies start with content strategy. Text will never lose its potential value, but marketers must evolve from publishing mainly text to producing more and more video. This isn’t news – you’ve heard it before – but are you doing it? 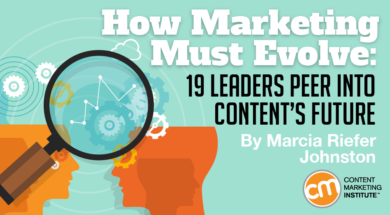 The best marketers rally a team of content producers within marketing and beyond – including the sales team, the customer-success team, influencers, and customers – to develop and amplify content that helps people solve problems they care about. Marketing is sitting on a goldmine: all that content typically treated as post-sale documentation. Your opportunity, should you choose to accept it, is to unify your company’s content strategy across the buyer’s journey, from discovery to support. To accomplish this, marketing must partner with the folks who create support content, like product documentation and training material. Consider putting in place a content product manager: a senior content strategist steeped in user research, experience design, product management, instructional content design and development, content analytics, and growth hacking. Look for someone who understands the content experience related to product use as well as the way content fits into the go-to-market strategy. Marketing needs to lead a culture of content that transcends individual functions of the business. To do this, we need to communicate what we know about our customers and the market potential throughout the business so that everyone involved in planning, creating, distributing, managing, and measuring content can align their efforts on common insights and goals. We must move toward intent-based marketing and content creation – really understand the intention of our audiences. To accomplish this, marketers have to work more closely with sales, support, customer success, and other teams across the company. Our systems need to personalize and contextualize content dynamically – that is, each time it’s delivered. We need to speak to each customer or potential customer in a way that motivates him or her in a certain time and place, on whatever device he or she is using. Tomorrow’s marketers need to make good on two promises: personalization and omnichannel. Every year, the public becomes less tolerant of irrelevant messages. People want what they want, when and where they want it. It’s that simple. Of course, simple for the consumer often means challenging for the supplier. We must eventually have the ability to create customized (adapted) deliverables using individual, personal user histories in any format or channel. The first step is to build a focused list of the people you want to serve and the things you’re good at serving them. Scrap the rest, and make your core assets adaptable and awesome. The future of marketing looks a lot like the past of marketing – with added help from robots. Robots increasingly broker who sees what content and how. They are our friends if we give them the attention and nurturing they need so that they can help us. Choose a focus. Don’t try to be all things to all people in all channels. Structure your content for use across channels and for personalization and marketing automation. Artificial intelligence will make message targeting and delivery easier over time, but content has to be ready with structure, metadata, and schema in order to play well with the robots. Build strong alliances with IT, and build strong budgets for technology. Marketing’s relationship with technology will only deepen. Marketers are learning more about what to measure, how to capture those metrics, and how to report these to your leadership teams. Creative teams, technical teams, and analytics teams need to collaborate more than ever. One word: Cognitive. Marketing teams need to learn how to mine user data from search, social, and web analytics to serve more relevant content to their target audiences programmatically. That means using tools like the Alchemy API to find patterns in content of interest to the audience and to develop models that serve audience needs from those patterns. We all know that effective marketing and excellent customer experience require great content, but “great” is easier said than done. Marketing teams may spend months defining buyer personas and then struggle to write for a CIO versus a CMO. Also, with content coming from so many sources – marketing, product teams, external agencies, content marketing platforms – it’s challenging to ensure high-quality, on-brand, on-persona content. It’s time for marketing organizations to prioritize their content operations by embracing the three pillars of content effectiveness: goals, guidance, and governance. Goals ensure that content meets established standards related to style, terminology, and tone of voice. Guidance gives writers nuanced feedback based on those goals. And governance ensures that writers understand content issues and how to fix them. Marketers have overinvested in producing and advertising their content while underinvesting in what happens after someone clicks through to it. We must turn those moments of attention into engagement, ideally increasing the velocity with which people move through your sales pipeline. How do you achieve this? Not by producing more content; SiriusDecisions estimated several years ago that 60 to 70% of B2B content “sits unused.” Rather, pinpoint the content that your visitors find useful and steer more people to it. As more and more niches approach content saturation, outstanding content creators and teams will be in ever-higher demand. Great content is a crucial brand differentiator, so marketing teams need to foster creativity AND run at top speed. That might mean recruiting and budgeting to build your content dream team or finding a freelance network you can rely on. Whatever your ideal team structure is, put it in place and get out of the way so they can start creating the content that will become your competitive advantage. The opportunities for marketing teams lie not in adopting any particular technology or approach but in designing strategies attuned to their specific aptitudes and competitive opportunities. For example, long-form content can be remarkably successful – but not for everyone and not for every message. Similarly, structured content can be a game-changer, but organizations need to choose carefully from its rich menu of methods and tools to benefit – and, indeed, to avoid being worse off than before they adopted it. In the last few years, the general maturity of content production has increased, so more companies are turning out higher quality content more consistently than ever. In this competitive environment, jumping on the next tech bandwagon won’t be enough. The challenge for marketing teams is to gain knowledge and exercise judgment as to which architectures and approaches best suit their own strengths and strategic plans. How about you? What do you envision for the future of content from a marketing perspective, and how do marketing teams need to evolve to prepare? Do you agree with what you’ve read? What’s missing? Let your insights fly in a comment. Let’s create our future together.